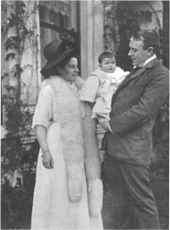 On 24 June 1908, he married Helen Reilly Barbour, daughter of textile industrialist John Doherty Barbour and sister to Sir John Milne Barbour- known as "Milne". Their daughter, Elizabeth Law-Barbour Andrews (known by her initials, "ELBA"), was born on 27 November 1910. The couple lived at Dunallan, 20 Windsor Avenue, Belfast. 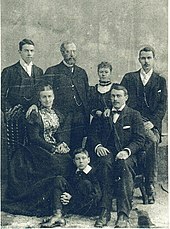 It is known that Andrews took Helen to view the RMS Titanic one night, shortly before Elizabeth was born. After Thomas's death, Helen remarried; she died 22 August 1966 in Northern Ireland and is buried in the Barbour family mausoleum at Lambeg. As the evacuation of the Titanic began, Andrews tirelessly searched staterooms telling the passengers to put on lifebelts and go up on deck. Several survivors testified to have met or spotted Andrews several times. Fully aware of the short time the ship had left and of the lack of lifeboat space for all passengers and crew, he continued to urge reluctant people into the lifeboats in the hope of filling them with as many people as possible. Andrews was reportedly last seen by John Stewart, a steward on the ship, at approximately 2:10 a.m., ten minutes before the Titanic sank into the Atlantic. Andrews was standing alone in the first-class smoking room staring at a painting, Plymouth Harbour, above the fireplace, arms folded over his chest, his lifejacket lying on a nearby table. The painting depicted the entrance to Plymouth Sound, which Titanic had been expected to visit on her return voyage. Although this has become one of the most famous legends of the sinking of the Titanic – published in a 1912 book (Thomas Andrews: Shipbuilder by Shan Bullock) and thereby perpetuated – Stewart, in fact, left the ship in a lifeboat at approximately 1:40 a.m., half an hour before his reputed sighting of Andrews. There were testimonies of sightings of Andrews after that moment. It appears that Andrews stayed in the smoking room for some time, then continued assisting with the evacuation. At around 2:00 a.m., he was seen back on the boat deck. The crowd had begun to stir, but there were still women reluctant to leave the ship. To be heard and to draw attention to himself, Andrews waved his arms and announced to them in a loud voice. Another reported sighting was of Andrews frantically throwing deck chairs into the ocean for passengers to cling to in the water, though he may have been mistaken for chief baker Charles Joughin, who survived the sinking and reported doing the same thing. He then headed towards the bridge, perhaps in search of Captain Smith. Andrews was last seen leaving the ship in its final moments. His body was never recovered. Asteroid 245158 Thomasandrews was named in his honour in 2004. ^ "Thomas Andrews – A Talented Designer That Met With A Tragic Fate". Titanicuniverse.com. 16 September 2014. Retrieved 15 June 2017. ^ The painting is often incorrectly shown on television and in movies as depicting the entrance to New York Harbor. ^ British Wreck Commissioner's Inquiry Day 6 – Testimony of Charles Joughin, Titanic Inquiry Project. Retrieved on 5 November 2017. ^ Levy, David. 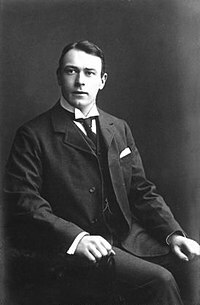 "Asteroid Named for Titanic Designer Thomas Andrews". Encyclopedia Titanica. Retrieved 22 September 2017. This page is based on the Wikipedia article Thomas Andrews; it is used under the Creative Commons Attribution-ShareAlike 3.0 Unported License (CC-BY-SA). You may redistribute it, verbatim or modified, providing that you comply with the terms of the CC-BY-SA.